Summary: In this long post-release interview published in the September 2015 issue of Dengeki Nintendo, producer Kojima, director Takumi and art director Nuri talk about their recently released Dai Gyakuten Saiban ('The Grand Turnabout Trial'). Now the game is ready, the team is free to talk about all kinds of things, like how smooth development actually went. They talk about the earlier days of the project, about the length of the original scenario of the game, about voice acting, about overall art design, motion capturing and character modeling and even the marketing campaigns in Japan. 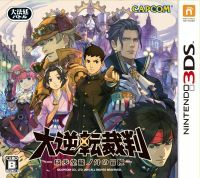 Dai Gyakuten Saiban is the first title he produced in the Gyakuten Saiban series. He is also producing Monster Hunter Cross at the moment. Q1: Which minor characters do you like? A: Cosney Megundal. I like his form and aura. His name sounds quite cool in London…no, probably not (laugh). Q2: A grand turnabout of your own. A: This happened about ten years ago. A development team on the same floor was working on a game moving monsters around and I thought: “That’s gotta be tough work,” as if I had nothing to do with it. Two weeks later, I was added to that team. This is the tale of how my life was turned around (laugh). The father of the Gyakuten Saiban series we all know! Planner, scenario writer, director on 1 ~ 3. He was also director of Ghost Trick. A: Mr. Natsume Sōseki. He is a real person, so I made him with respect. We first started using motion capture with this game, but I think I’ve got the hang of this new method of presentation (laugh). A: Before I joined Capcom, I was looking for a job that had to do with mystery fiction, so I went to publishers. But now I’m with Capcom and supervising this series. That is my grand turnabout. Has joined the series as the main character designer since Gyakuten Saiban Yomigaeru Gyakuten (Ace Attorney DS). He does not only design characters, he is also the art director. A: I like Uzukumaru. And with Uzukumaru, I mean the one being carried (laugh). The way they sometimes seem to work together, and sometimes not is chaotic, and I love that. A: This happened just recently, but I was just about to go home from office, when I couldn’t find my bicycle I always use to get to work. I looked around, but I just couldn’t find it, so I figured it was stolen. So I had to walk back home that day. And because it was inconvenient, I bought a new bike the next day right away. That night, I went out on my new bicycle to buy a bento lunch box, and when I passed by the gyūdon restaurant on my way back…I saw a very familiar bicycle, floating among all the lights aimed at it. Then I remembered. I had come here to the restaurant on my bicycle for a midnight meal the day before, and had walked back to the office. My bicycle had not been stolen! . That is my grand turnabout (laugh). Interviewer: Congratulations with completing Dai Gyakuten Saiban! Now you have finally finished development, could you tell us how you really feel now? Takumi: I probably say this every time I finish a new game, but this time was really the most difficult. Not only was the development cycle long, but I also had to make something different from what I had been doing before, and there was the pressure I needed to add all kinds of new elements in the game, and writing the scenario cost me more time and energy than I had expected. You can still find all the nail marks I left as I rushed all over the place, without really carefully thinking about how to do things. So when I play it now, I think: “I really did my best here”, but also: “It was really difficult.” That’s how I feel now. Kojima: I think this is related to how much Mr. Takumi poured in the game, but the scenario of this game is really long this time, and getting all the resources ready to go with that scenario was really hard until the very end, and we really gave us all in these two years. We had all completely new main characters, and because of the Lay Judge Trials, so we had a lot of characters besides the usual witnesses. It’s all very grand, but this was the first game where I was not sure whether we’d really going to complete the project. I can tell you about this now, but we had several changes in the scenario halfway through. I’d think the story would stop here, but then it’d go on anyway, or the story would be changed halfway through. It was hard to see the whole image, so I was relieved when we finally got to the end. Interview: So the conclusion of the story was not like you had initially imagined? Takumi: It’s completely different. Perhaps it was just me being bad at having control, or perhaps greater powers were at work there… I arrived at the conclusion after going through a lot of trouble. One example of what was changed is the Lay Judge Trials. The system is a lot bigger than I had first planned. Cross-examining multiple characters at once is an evolution of the system in Layton Kyōju VS Gyakuten Saiban (Professor Layton VS Ace Attorney), but we did all kinds of new things, like having two witnesses getting entangled with each other. It was a very stimulating development floor. Nuri: Yes. Because it was a new project, we wanted to challenge ourselves with something new, a new way of presentation not used before in the Gyakuten Saiban series, so we went in quite aggressive. I think we all worked without having a clear idea of how it would end up. Takumi: I think I at least had a vague idea of that…(laugh). Interviewer: (laugh) Could you tell us concretely about those new ways of presentation? Nuri: Well, there’s Holmes’ playground, the Joint Deduction system. It’s something new, so I really tried to come up with a stylish look, something we could only do in this game. To be concrete, I think the camera-placement is really the main dish. It has a sense of speed, and turns around like that. We started to focus on the camera in the game we worked on before this one, but we went beyond what we did there. But in return, the amount of work we had to do on the 3D models increased. Until now we had simplified parts of the models we figured wouldn’t be shown on the screen anyway, for the sake of getting the game run smoothly, but in this game the camera turns around the models, and it often zooms in on parts, so they appear large in the screen, which meant we needed to make detailed 3D models. This time we even worked hard on parts that don’t show on the screen (laugh). Takumi: It was not just the models, the backgrounds also took a lot of effort. In this game, we have two kinds of the same backgrounds: normal backgrounds that look pretty, but also 3D models of the backgrounds so the camera can make 360 degree movements during Joint Deduction scenes. The hand drawn backgrounds have always been a selling point of the Gyakuten Saiban series, so we had to do research to figure out how we could show them in 3D while preserving the series’ feeling. Nuri: Yeah. When the camera swings around, 3DCG technology (like lighting) tends to standardize everything, making it feel cold. It was hard getting that 2D, hand drawn touch in the backgrounds. We really had trouble getting “hand drawn, soft lighting” that wouldn’t look off even in 3D. And like with what I just said about the characters, it happened often that background parts we hadn’t prepared would show on the screen, and we’d have to add in those parts. We’d have filler ceilings, figuring they wouldn’t show, but they’d be right there on the screen (laugh). Takumi: Trying to make it not look like a polygon games means you have to do a lot more work. Kojima: Because everyone was doing their best on the game, I in turn was scared from start to finish. ARE THEY GOING TO FINISH THIS IN TIME? (laugh). But the quality of the game has definitely increased, so I was basically having a fight with myself as I glared at the budget. When they got the basic elements finished at the end of 2014, and started getting everything in in 2015, the game really became much better. I was really impressed by their hard work, and how they tried to pursue what they thought would make the game fun. Takumi: I see (laugh). It’s the first time Mr. Kojima worked on the Gyakuten series. How was it? Kojima: We had a large team this time too. The game was based on Gyakuten Saiban, but it was also its own separate project: Dai Gyakuten Saiban. So for the team it also felt as a new start, but after a misty beginning, we finally got something at the end of which we could say: “Yes! This is Dai Gyakuten Saiban!”. The Longest Scenario In The History Of The Gyakuten Saiban Series! Interviewer: Could you tell us about any happenings that made an impression on you during the development of the game? Takumi: We finally got a demo ready of the Joint Deduction system around Christmas 2013, and we felt confident about it as a team, so we took the ROM to Tokyo at the end of the year to show the top brass the demo. Everyone smiled (laugh). I had given them a good Christmas present, so I could go back and clean up the office for the year (laugh). Nuri: I had worked on the trial parts in earlier games, so I knew how they’d be, but there was a lot I didn’t know about the Joint Deduction system, like how it’d look and whether this new mechanic could sell the game. When I saw the demo, I finally understood how it was going to look. That was when I realized what it was going to be, and that also meant I finally realized what kind of models I needed to make. That was a big turning point in the development cycle. Takumi: It was still vague both in artstyle and scenario. I had first written in the proposal that “Holmes would say something odd, and you’d correct him,” but once I started thinking about what ‘something odd’ meant concrete, it turned out it was pretty hard. And what really made an impression on me was the fact we didn’t do the research trip to London after all. Why? Kojima, we can still make it… (laugh). Nuri: We already talked about that Ijinkan trip early in the project, but that idea was kinda forgotten after we started to talk about when we’d finally go. Nuri: I wanted to go to Baker Street. If I had gone there, I’m sure the quality of the game would have improved tenfold. Takumi: Even as time progresses, they keep the buildings as they were over there. You can still feel the old ambience in this day and age. Takumi: Don’t ever forget what you just said (laugh). Nuri: It’s written in this article now (laugh). Interviewer: (laugh) Can we ask Mr. Kojima for a memorable story now? Takumi: The scenario was longer back when I was planning it, compared to what it is now. I am bad at controlling this. This part is really the hardest to control. Nuri: There were many more characters too. Kojima: Dai Gyakuten Saiban is a new project, and it features Sherlock Holmes, so I really saw that Mr. Takumi really tried to pour everything in it. Nuri: Me too (laugh). Mr. Takumi’s scenario have become longer and longer over the years. When he’s in the zone, he just keeps on writing, and the volume of the scenario just keeps growing faster and faster. I always look forward to it, but I’m also always kinda afraid (laugh). Interviewer: Mr. Nuri, what made an impression on you? Nuri: This happened when we were adjusting the animation of Van Zieks pointing his finger. I was there overseeing everything, and I was there explaining and showing how to do it, touching the fingers of the person working on it. “More like this, softer!” But both of us were men, so when our fingers touched each other… it felt a bit strange (laugh). And they took a picture of us as reference m material (laugh). But if you get the angle of a finger just slightly wrong, it looks like a woman’s hand, and Van Ziek’s fingers are especially important, so I couldn’t just be happy with anything there. In the end, I had to work a bit on the data myself (laugh). I hope people notice where he just doesn’t put any stress on his finger. By the way, the nuance on his fingers are slightly different for when he wears his mantle and when he doesn’t, so I’d be happy if people would look at that. Takumi: The motion capture staff took a lot of photographs as reference materials. They also did the same with how Van Zieks holds the bottle he throws away. Kojima: Now you mention animations, I love the one where Naruhodō slams the bench. There are different phases, and they show his growth. The one where he thinks he slaps the bench, but only slaps it and looks around him is good. And the eyes! Asōgi talks while standing next to him, but you have Naruhodō looking at him with trust. And when Holmes strikes a pose, his eyes also say: “Look at me!” It really feels good to see details like this. Takumi: To be honest, I think we entered forbidden grounds with the eyes. The Sherlock Holmes in the original stories has the image of being able to get all kinds of information for his deductions just by looking at the eyes of people and to reflect that in the game, I thought it’d be good if we could move the eyes of the characters. I think the scenes where Naruhodō looks around restlessly are very characteristic for the game. Kojima: But moving the eyes is very work-intensive. Much more than synching the mouths. Takumi: And it couldn’t be done automatically either. Nuri: They’d come out in unexpected ways and made them look like puppets. It was really hard getting natural facial expressions one by one. Takumi: Talking about detailed animations, pay attention the Geena’s coin roll. I used to do magic tricks in university and talked about that with her animator, and they recreated that. It doesn’t appear often, but even the motions of the fingers are recreated in detail and I really like it. Interviewer: Mr. Kojima went around the country to promote the game. How was it getting in contact with the fans? Kojima: This game has a “special sense of pace”, from the pace of the dialogues to the meticulously made animations, and you can show that with just a promotion video, so I wanted to have as many fans as possible to be able to play the game for themselves. That is why we had store demos all over the country. The reactions were different at each location. The fans were of course everywhere enthusiastic, but there were regions where they’d react very quickly, but also regions where they’d stay silent and would come talk afterwards. There are many events held in Tokyo, Nagoya and Osaka, but not as often in Hokkaido or Fukuoka, so we were thanked there not only by the fans, but also by the stores. We got feedback that people were glad they could try it out, so I’m glad we were able to do this. Mr. Takumi, thank you for writing the scenarios for the location-specific store demo special videos The Marketing Trip Across Japan. Takumi: The other games featured in the campaign also had special videos, so we made them too. They are also available on the official website, so take a look. Interviewer: Talking about videos, the commercials for this game had quite the impact. The casting choices were very surprising. Kojima: We could have gone all kinds of way with commercials with famous people, but we wanted to make a big impression so people would get interested in Dai Gyakuten Saiban, so we chose for the explosive powers of Untouchable’s Yamazaki and Cunning’s Takeyama. You often see them together on TV, but they have never worked together on a commercial. That was also one of the reasons why we offered them the role. Mr. Takeyama had already played the games, and said it was a honor to be able to say “Objection!” Mr. Yamazaki too already knew the series, and they both acted with a lot of energy. Nuri: I supervised the costumes and props, but they were made in quite some detail. Takumi: Now we’re talking about marketing, we have a young, energetic one now in our team, and they came with all kinds of ideas, like something for Twitter. And we had the collaboration with Real Escape Game, and as the one working on the scenario, I was really thinking: “When will I finally be finished with writing Ryūnosuke’s story?” (laugh). Interviewer: So you wrote the scenarios for the ideas that came from the staff? Takumi: Yes. They were good ideas, so I said we’d do it. It can only help. Takumi: Oh, that, I really wanted to do that, so I kinda forced my way in (laugh). But after I had worked on the scenario they had prepared and made a video, they got angry at me because it was too long (laugh). Interviewer: What was it you wanted to write about with the story this time? Takumi: The goal of the game is to introduce everyone to the classic mystery fiction I love. I love Sherlock Holmes, and got into mystery fiction thanks to him, so I wanted to write a mystery story that was set in that unique atmosphere of 19th century London, a mystery story that could only have happened then. A case where you can really feel the presence of a world without scientific investigation, with gas lamps and horse carriages. Interviewer: I have the feeling it’s difficult to write a convincing mystery story that features no scientific investigation techniques. How was it writing such a story? Takumi: Taking in consideration the ups and downs, I’d say it’s about the same. With stories set in a modern setting, you have cell phones and you can get everything done. That also makes writing a story more difficult. And while it’s more difficult to find decisive evidence in 19th century Great Britain, it also opens the doors for ideas you can’t use in modern settings, and it forces you to think in a different way. I have read a lot of mystery novels from that time period, so it is easier for me to come up with ideas. Interviewer: Could you tell us how you feel now you managed to have that 19th century London setting you’ve been wanting to use for so long, and with your own Sherlock Holmes you always wanted to write about? Takumi: The Holmes who appears in Dai Gyakuten Saiban is the Holmes I’ve always had in my mind, so to be able to show him off to everybody and have him appear in a grand adventure, I can’t be happier. I’ve always wanted to make a game about Holmes, so it’s a dream come true. I don’t what to say now people play the game and say that Holmes is really like a Gyakuten Saiban character, or that he is cute. I’d also like to hear what people who like Conan Doyle’s Holmes have to say about him. I have written the character with both love and respect for the original, so I am curious as to how fans of the original stories look at him. Interviewer: Was it perhaps difficult to write him because you love the character so much? Takumi: I do love Holmes, but I like the Holmes you see from a not very serious point of view. There are a lot of parodies to be found of Sherlock Holmes, and there are quite some Holmes from parodies I like too. So I was not hesitant at all at having some fun with him. I think he’s a character who is very open to all of that. Interviewer: During the Joint Deduction sections, the player observes the crime scene, but does the inspiration for that come from the original stories, where Holmes would have exceptional powers of observation? Takumi: Yes. I also thought the idea of looking at people from different angles, from angles you had never tried before and finding hints like that was very alluring, so I tried to do something with that. But because of that, the staff had to make the character models so you could look at them from any angle, so that was quite hard for them. We had things you could only see from a certain angle. Nuri: We had to change the size of the parts, or their placement sometimes. Often, we’d put everything together and then make adjustments to get it to fit in the camera. An Hour For Objection!? Hardships on Voices And Motion Capture. Interviewer: The game has quite a lot of big voice actors. Takumi: Nuri and I’d get sound samples from the sound designers, who would hide the names of the actors and then we’d choose the actors. I actually didn’t want to go for the well-known people, but when I chose the people I thought perfect for the roles, it turned they were all well-known voice actors. Interviewer: Did the voice recording go smoothly? Takumi: Yes. We had more than ten takes, which we put in the game to try out, but it didn’t sound right… I remember we did the same recording again the next time. In the end, we used the first recording (wry smile). We really took up Mr. Shimano’s time and effort. But it’s always been like this with the voices of the protagonists in this series. First it was just members of the staff. I am the original Naruhodō Ryūichi (Phoenix Wright), but I took about thirty to forty takes. But I am an amateur of course. We just kept on recording, and we selected that one miraculous take…That is how we did it first, but perhaps that wasn’t the right way. I am really sorry we had professionals go through all of that. Interviewer: In the previous interview (June), we heard you used motion capture this time. Was there something about the motion capture actors that made an impression on you? Takumi: We hired the actors from the Himawari Troupe for the motion capturing. We first did that for Holmes. We wanted to do the Joint Deduction sections. And we also did that for Sōseki. Interviewer: So Sōseki’s movements are done with motion capturing (laugh). Takumi: Yes, Sōseki and Holmes are done by the same person (laugh). It was a person who was very good at cool poses, so I asked them to do whatever they wanted, and I chose a few from about ten different poses to be used in the game. Interviewer: So you did not ask for specific poses? Takumi: I explained what for character Sōseki was, and what for scene it would be used for and then had them just move around. And then we’d just be following our instincts. With Holmes I wanted him to be deducing while almost dancing, so I asked for snappy movements. We didn’t have just one actor. We also had someone to do women, like Susato. Finally, we had one character left who appears very late in the game and they are a character who also moves like they are dancing around, but different from Holmes. I had the movements of the actresses of the Takarazuka Revue in mind, but I figured I could never ask them, but it was almost a miracle that ex-Takarazuka Revue member Shiotsuki Shū joined the team. And she really danced for us, but it’s almost like she has a solid core right in the middle of her body and she’d never tremble one bit. Her movements had a kind of pressure that made you look in awe. Nuri: That was really shocking. It was like she was completely synchronized with the character. Normally with motion capture, the axis of the model will tremble slightly and you need to correct that later. We didn’t need to do that with her. Takumi: Before we started recording, I did research by watching a lot of Takarazuka DVDs (laugh). I wrote down all the movements I liked and the ones I wanted to try out, and had her do them, and I was really glad she happily agreed to doing that. It might be a bad habit of mine, but I think everyone enjoys Takarazuka in their own way. Very cool scenes can look funny if you look at it from just a different angle, and I wanted to portray that gap. I hope everyone will see Ms. Shiotsuki’s acting and enjoy. Interviewer: We also heard in the interview last time that the final adjustments always takes the most time with games in the Gyakuten Saiban series. The volume of this game is the largest of the whole series until now, so was tuning up the game difficult again? Takumi: Like we talked about earlier, we had some drastic changes to the structure of the whole game and the scenario, and because of that, we didn’t have as much time left for the final adjustments as originally planned. I was really saved by the fact we had young, energetic staff members who were good at presentation. Interviewer: Where did you focus on? Takumi: I spend quite some time with Sōseki. I really wanted to have him talk as much as possible while striking poses (laugh). And up until now in the series, the break scenes (when the true criminal is revealed) are supposed to give you a feeling of catharsis, but I thought there might also be other ways to do that, so I have tried something different this time. Animations where multiple characters get together also took time. The tea animation of the Garrideb couple for example, or the scarf of the O Malley’s. You’d be surprised at how much you need to think about when you link up two separate animations. Following Animation A up with Animation B, but not with Animation C, it’s like a puzzle. If you connect them all, it becomes too long, but if you get rid of the pauses, you get better pacing, all of that. You really get to show what you’re made off with these ‘invisible’ parts of the game. With 3D, things become more realistic, but the pacing always gets worse. It’s hard to say what the right method is of shortening these animations, but I am glad we worked on adjusting them. Interviewer: What was your first impression when you heard the game was not be set in Japan, but in 19th century England? Nuri: The first Mr. Takumi told me was that the game would start in London. And that could be alluring too, but I also thought that the same period in Japan, the Meiji period, was also very interesting too, so I made a suggestion. “If we start in Japan, you can have the feeling of setting out on a trip to London, and it opens up the game world more.” I think Mr. Takumi was worried about the size of the game… If the game would start in Japan, that’d mean we’d need a courtroom set in Japan, a judge, and it’d mean a lot more work, so he was hesitant. Takumi: I am the director (laugh). Nuri: So I told it’d be okay if we started in Japan. By having the game start in Japan, you also get a lot more variety in characters and background. You could really portray the time period and the differences between the two cultures of the countries by putting them next to each other, and it really showed off that this would be a different type of Gyakuten Saiban, and that also motivated us. Takumi: I was worried about the size of the work that had to be done, so I was happy when he said it was okay. I think it was only you and me back then? Nuri: The other staff members hadn’t been decided yet, I think. Everyone entered the team knowing we’d have both Japan and London, and two courtrooms and judges. Interviewer: You focused on atmosphere this time. Could you tell us what did you exactly? Nuri: I wanted to portray Japan like it was still some rural area compared to London. That would link up to that gap when you arrive in London, that emotion when you first arrive in a fully developed civilization. Japan still hadn’t gone through the industrial revolution and the sky was still blue and clear. London on the other hand was right in the middle of the industrial revolution, and there the sky is dark with smog. I really paid attention to this difference in the air, in the atmosphere. The tranquil sky of Japan, and the metropolitan London. Takumi: I asked him to make the dark side of London really dark, to make the player feel the darkness of the city. Nuri: At first, I had considered a nicer, slightly exaggerated world, with more and clearer colors, but I was asked for something realistic, so I changed directions. But if you go for historical realism, the colors tend to fade, so I really paid attention to the art for this game to come up with ideas to use colors to get nice visuals like a painting, or how to use faded colors but to still present beautiful visuals using the sky. Interviewer: What did you exactly do to achieve that? Nuri: I hope everyone thinks everything feels natural, but to give an easy example, Briar Road, where Sōseki lives. There’s fog floating there, and I think elements like the smoke and the look of the streets feel like London back then. This was supposed to be first location you’d see when you first arrived in London, which would show off the difference in the sky, but the story changed a lot, and we got fewer outside locations, so it was difficult achieving this. Interviewer: And where should we look for the sky in Japan? Nuri: I hope people will notice it in the opening movie. We only have one inside location in Japan, inside the courtroom. The trials back then were often military trials, so we have a dark courtroom, with a very solemn atmosphere. I wanted to start right away with something very different from Gyakuten Saiban. So the judge also looks strict, and is not someone you can easily to get close with. If we had the usual judge, it just wouldn’t be that sense. He’d just forgive you (laugh). We have the ancestor of Auchi (Winston Payne), but if we’d also have the usual judge, it would, in both the good and bad sense, be too familiar, so we started with a strict judge in this game. So the atmosphere in the Japanese courtroom is dark, and you can feel the tension in the air. We first had insects flying around the electric lights, but that had been cut without me noticing (laugh). Takumi: Japan back then was a world of wood and paper, so we wanted to have a gap for when you crossed to the world of stone and bricks. Nuri: I paid much attention to the juxtaposition, of the simple, wooden court of Japan and the London court made with marble and gold decorations. Oh, and this happened early in the development cycle. Naruhodō wears a black student uniform, right? And the court was dark too, so I was worried about how it’d look. There was a time where it was so dark, you could only see his head! (laugh). But we figured we’d get in the end and kept making adjustments, and I think that in the final product, we managed to present that dark and heavy atmosphere like we had first planned. Takumi: London is dark too, so I remember you had problems with matching up colors. Nuri: The colors on the monitors of the development team, and on the screen of the Nintendo 3DS are actually very different. Simple and clear colors, like yellow and blue, don’t really look that different even if they change a bit, but we were working on that precise balance of neutral colors for the atmosphere. We’d put in on the 3DS only to have completely different colors, which destroyed the atmosphere, and we had to make adjustment after adjustment to get the colors we wanted. Takumi: When we put out assets to be used in promotion, we also had to divide it in those with 3DS colors and not-3DS colors. Nuri: Even with black, we’d have greenish black or reddish black. But we focused the most on the colors, so we worked on that until the very end. Interviewer: Can we ask for one final message for the readers? Takumi: Now the game has finally been released, I think there will be people who have already played it. I talked about a lot this time, but one of my goals was making an “impressive world” born out of the focus on the details. The whole team worked on this game with everything it’s got, and I hope a lot of people will play this. I hope that people who haven’t played the game yet will read this article, believe us and play the game. Nuri: This was a new project, so I poured my all in creating a completely new world! It has a different ambience compared to the main series, but I think it’s still Gyakuten Saiban. I also made a wide variety of unique characters. I can promise a very densely packed experience to not just fans of the series, but also people who have never tried it out before. I am convinced you’ll find a favorite character, so I hope you play the game and have fun with it! Kojima: The protagonists have always been defense attorneys until now, but this time we added the great detective, with a new chemical reaction as the result. Some might think this is a difficult game because it’s about trials, but it really isn’t. It’s a well-paced, pleasant game to play, where you proceed in the story by pointing out contradictions in the testimonies of witnesses. It is also a game where you can have fun just by looking at the conversations between the characters, so I think that many people will enjoy this game, both fans of the series, and people who have never played it yet. We also have DLC that you can enjoy after completing the game, so have fun with that too.